The Vasa Blad Children’s Club was organized on April 12, 1947. The date we have seen published for many years is 1946, but the minutes of the first Vasa Blad meeting make it clear that it was 1947. An article April 17 1947 in Verskusten also mention it was organized 1947. The primary organizer and first leader was Irene Bryggman, who continued to be involved with the club for 50 years. She had many assistants over the years including Margaret Bleher and Marie-Ann Hill who taught the singing. The first Vasa Blad Children’s Club chairman was Marlene Berg (now known as Marlene Swaffar). The first club secretary, Carl Peterson (son of Leonard Peterson-District Master in 1950), produced well-written minutes of club meetings until September 1948 when new officers were elected. The new secretary, Mary Ellen Johnson, continued the meeting minutes until May 1950, when the meeting minutes stopped with no explanation. These old minutes gave an interesting picture of club business meetings and some fun activities such as picnics and parties, but only occasional mention was made of practicing Swedish songs and dances. However, we can surmise that was happening because there was frequent mention of performing at Sveaborg and Tegner Lodges and various functions such as Sweden Day and a “Lucia Festival”. The club frequently held “penny marches” at their meetings and raised amounts of money such $1.21 or $3.83. The children were to earn their own money for dues. They paid a nickel a meeting the first year and then raised it to a dime in the second year. Their expenses were comparable, with hall rent only $1.50 per meeting and the total food costs for one picnic only $4.76. 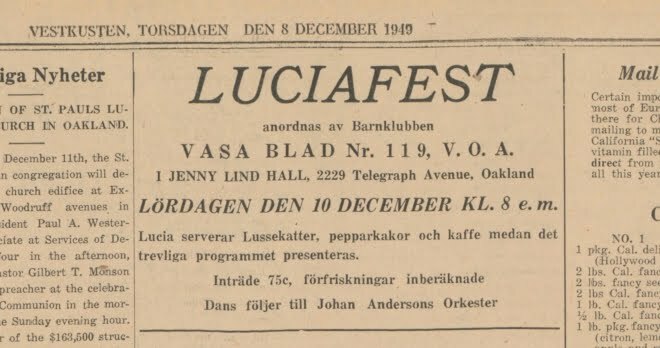 The first major performance by Vasa Blad was a “Lucia Festival” held at Jenny Lind Hall in Oakland on Dec 10, 1949. Marlene Berg was a pretty Lucia in the Oakland Tribune photo. * Hundreds of tickets were sold to other lodges and the public. The meeting minutes said they made no profit. The Vasa Blad club was invited to perform at the Grand Lodge Convention held in Los Angeles in July of 1950. They received donations from the Grand Lodge and the Golden Gate District Children’s Club Fund and held fundraisers to cover their expenses which included $233.02 for all their train fares. The Vasa Blad Club was associated with Sveaborg Lodge from the beginning. However, early members were not just from Concord, but Pittsburg and as far away as Oakland. In April 1950, they decided to recruit new members to Vasa Blad by sending an invitation to the three East Bay Lodges (Tegner, Framåt, and Gustav-Vasa), the Swedish Men’s and Ladies’ Societies, and the “Swedish newspaper” to bring their children to Vasa Blad. Since their meeting minutes stopped in May 1950, we have no knowledge of the response they received from their invitations. What we do know is that there was a fair amount of collaboration between the Vasa Blad and other Golden Gate District organizations that has continued even in recent years. Vasa Blad had several very active members from Tegner for a number of years after their children’s club became inactive. Older Vasa Blad girls have also represented most of the East Bay Swedish organizations in the queen’s court at the Sveadal midsummer festival. The largest collaboration with other lodges occurred in the summer of 1964 when the Western Vasa Youth Tour to Sweden was organized with support from the Grand Lodge and three Districts. * A very large smörgåsbord fundraiser was held to raise funds. The Vasa Blad leader, Irene Bryggman, and Ulla Lundquist were the two leaders of the Golden Gate District 12 group. District 15 of Southern California and District 13 of the Pacific Northwest also provided leaders and children from their youth clubs. Children ages 12 to 14 from all the youth clubs had to audition in dancing, singing and instrumental music. In District 12, sixteen children were chosen from the 50 members of the five active youth clubs. The two chosen from Vasa Blad were Clydine and Leslie Granfors. Several other Vasa Blad members who were too old or young to qualify also went with the group because their parents were leaders or chaperones. This included Vice Tour Leader Ragnar Berg’s family. The tour in Sweden consisted of five weeks of performances. They visited 22 cities and 22 different Swedish Vasa Lodges and participated in five Sweden American Festival Days, including a final one at Skansen. They sang Swedish and American songs, and danced both Swedish folk dances and American square dances. There were special solo and group performances involving singing, instrumental music and Hawaiian, Mexican and Indian dances. They finished the tour with a shopping day in Stockholm and then had two full weeks of vacationing with their families in their old country before returning home. They were warmly welcomed by everyone in Sweden from public officials, the Vasa Lodges, and everyone they met in their travels. Several people who went said it was one of the most memorable experiences of their lives. A program was produced that provides details of the planned trip and pictures of the youth participants and leaders. It accompanies this document. In 1974, seven other Vasa Blad teen members went to Sweden and performed at Uppsala, Stockholm, Kiruna, and then went to Oslo Norway. They were the Morn and Bystrom girls, Greg Swaffar, Kari Weiner, and one other girl. They were accompanied by parents: the Morns, Swaffars, and Maj Britt Bystrom. Throughout its history, the Vasa Blad club has performed vocal and instrumental music and folk dancing regularly for Sveaborg Lodge and has been invited to perform at many other venues over the years. These include many Sweden Days at Crow Canyon, Borges Ranch and other places, many years at the Scandifest in Turlock, at the SWEA Jul Fair in San Francisco, at the midsummer festival in Sveadal, and at the District 12 conventions including those in Walnut Creek in 1994 and Concord in 2006. Numbers participating in Vasa Blad over the years have varied as children grew up and left the club, families moved, and other priorities interfered with attendance. In the earliest years there were about 28 members with about seven dropping off that roster. Since the year 2000, the membership totals have varied from a high of 30 to a low of 14 as our youth entered, some left gradually as they went off to college or became too busy in high school to continue. Then in 2012 and 2013 we had an influx of new members whose average age was about five or six. Our last two older girls are graduating this spring so we are now a very young club with a total of 17 active members plus two more girls who graduated but return to us when they are home from college. The current Vasa Blad club focuses on folk dancing in the spring. Each year we perform at a different assisted living facility on a Sunday in April. Then we perform for Sveaborg Lodge on the following Friday. In the fall we begin to practice for the Lucia pageant that is performed first at an assisted living facility and then at the Sveaborg Julfest in December. All the girls wait excitedly for their turn to wear the crown of candles! We also do occasional crafts. One of the favorites of both children and parents is making Påskris (vases of branches decorated with colorful feathers and plastic eggs). These are used as table decorations for Sveaborg’s meeting near Easter when the children usually folkdance. Because we are one of the few lodges with a children’s club, our girls over 16 have been in demand to serve as maids in the midsummer queen’s court representing lodges who don’t have any young girls. This has been another fun perk for the girls in addition to serving as Lucia. All of them dream of having the opportunity to be the Midsummer Queen, Columbia, or Svea after they are 18. We encourage our families to attend the midsummer festival.Those who attend participate in the folk dancing around the maj stång (maypole) after they have helped decorate it. Then in the afternoon, they often end up dancing on the lawn to our recorded dance tapes with others from Vasa Blad or Sveaborg or anyone who wanders by! Tne trend we have seen in Vasa Blad is the repeating generations of participants. Founder Irene Bryggman had first her children and then her grandchildren in the club. Finally several of her great grandchildren became Vasa Blad members. The last of that generation is graduating this year. As they have children, we expect they will join Vasa Blad too. The current Vasa Blad leader, Rosemary Fassl brought four of her grandchildren to Vasa Blad and they were active for many years. Now two of them, Rachel and Stacey, have daughters in Vasa Blad and they have taken over the folk dance leadership from Rosemary. Keeping the next generation active in the Vasa fold is what we need to do to keep the order going and thriving!